So I love photography and love taking photos but I get very frustrated when trying to take photos for my etsy listings. I have been out in the chilly garden taking photos nearly all morning so my hands were almost frozen. I filled up my memory card and wore out my battery but I think I got some good ones. Plus I wasn't alone, my boy was there to keep me company. As most people who know me know I have three cats. Spencer basically follows me around most of the time, I think really he is a dog. Whenever I go out to take photos he tries to sit on top of everything. 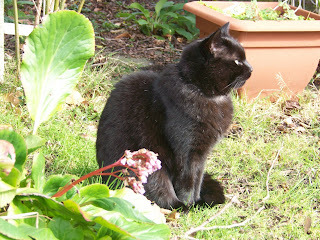 As it was really sunny today he just sat next to me at did some sunbathing. Aw he's gorgeous! ha, my cat is like a dog, but only with my dad.